Heat oven to 425°F. Heat dinner rolls as directed on bag. Place 1 chicken breast, boned side up, between 2 pieces of plastic wrap or waxed paper. Working from center, gently pound chicken with rolling pin or flat side of meat mallet until about 1/4 inch thick. Repeat with remaining chicken breast. Sprinkle with salt, oregano and pepper. In 10-inch skillet, heat oil over medium-high heat. Cook chicken in oil 8 to 10 minutes, turning once, until juice of chicken is clear when center of thickest part is cut (170°F). Remove from skillet, cut each in half; cover to keep warm. In same skillet, cook chile and onion over medium heat 5 to 7 minutes, stirring occasionally, until chile is crisp-tender. Meanwhile, in small microwavable bowl, microwave refried beans uncovered on High about 20 seconds or until hot. With serrated knife, cut each roll in half crosswise. Spread about 1 tablespoon refried beans on bottom half of each roll. Top with chicken piece, 1/4 of pepper mixture, tomato and lettuce; cover with top half of bun. 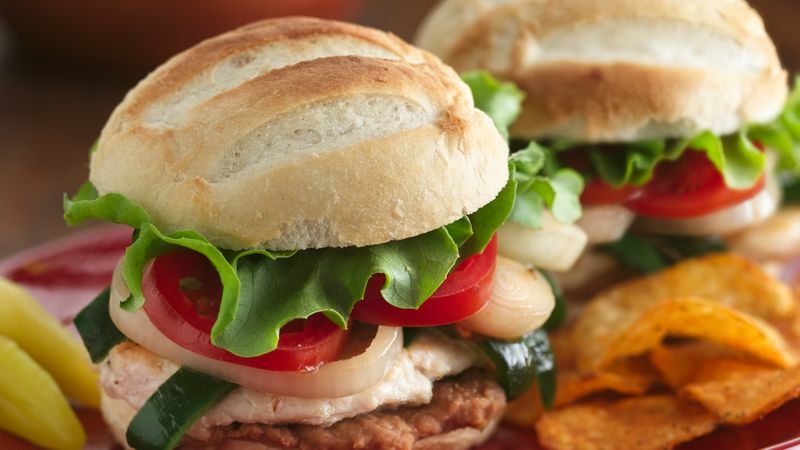 Trade the chicken for a slice of pepper Jack cheese, and you'll have a kicked-up veggie sandwich.